The high tensions between the Empire and the Church culminated in the ecclesiastical councils of 1074-75, many of the measures passed attempted to undo substantial portions of Henry III's policies. Among other measures, the councils denied secular rulers the right to place members of the clergy in any ecclesiastical office; this dramatically affected Germany, where bishops were often powerful feudatories. By this ruling, they freed themselves from imperial authority. In addition to restoring all privileges lost by the ecclesiastics, the council's decision deprived the imperial crown of almost half of its lands. This severely weakened national unity, especially in peripheral areas such as the Kingdom of Italy. 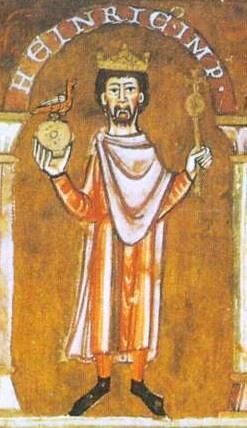 At Worms, on 24 January 1076, a synod of bishops and princes summoned by Henry declared Gregory VII deposed. Hildebrand replied by excommunicating the king and all the bishops named by him on 22 February 1076. In October of that year a diet of the German princes in Tribur attempted to find a settlement for the conflict, conceding Henry a year to repent from his actions, before the ratification of the excommunication that the pope was to sign in Swabia some months later. Henry did not repent, and, counting on the hostility showed by the Lombard clergy against Gregory, he decided to move to Italy. He left Speyer in December 1076, spent Christmas in Besançon and, together with his wife and his son, he crossed the Alps with help of Cunibert, Bishop of Turin, and reached Pavia. Gregory, on his way to the diet of Augsburg and hearing that Henry was approaching, took refuge in the castle of Canossa (near Reggio Emilia), belonging to Matilda. Henry's troops were nearby. Henry then launched his third punitive expedition in Italy. After some initial success against the lands of Canossa, his defeat in 1092 caused the rebellion of the Lombard communes. The insurrection extended when Matilda managed to turn his elder son, Conrad, against him who was crowned King of Italy at Monza in 1093. The Emperor therefore found himself cut off from Germany; he was unable to return until 1097. In Germany itself his power was still at its height. Matilda of Canossa had secretly transferred her property to the Church in 1089, before her marriage to Welf II of Bavaria (1072–1120). In 1095, a furious Welf left her and, together with his father, switched his allegiance to Henry IV, possibly in exchange for a promise of succeeding his father as duke of Bavaria. Henry reacted by deposing Conrad at the diet of Mainz in April 1098, designating his younger son Henry (future Henry V) as successor, under the oath swearing that he would never follow his brother's example. Henry was able to defeat his son's army near Visé, in Lorraine, on 2 March 1106. He died soon afterwards, however, after nine days of illness, at the age of 56, while he was the guest of his friend Othbert, Bishop of Liège. He was buried by the bishop of Liège with suitable ceremony, but by command of the papal legate he was unearthed, taken to Speyer, and placed in the unconsecrated chapel of Saint Afra, which was built on the side of the Imperial Cathedral. After being released from the sentence of excommunication, his remains were buried in Speyer cathedral in August 1111. The conflict between Henry IV and Gregory VII is explored in the novel Tiara i korona by Polish writer Teodor Jeske-Choiński. ^ a b c Whitney 1968, p. 31. ^ Brooke 1968, p. 116. ^ Bertha in the meantime had retired to the Abbey of Lorscheim. ^ Brooke 1968, p. 140. ^ Brooke 1968, p. 141. ^ Donald J.Kagay, L.J.Andrew Villalon (January 2003). Crusaders, Condottieri, and Cannon: Medieval Warfare in Societies Around the World. ISBN 9004125531. Retrieved 2008-06-05. One of two brief accounts of the battle of Volta reports it occurred on the same day as the battle of Elster (15 October 1080) in which Rudolf was fatally wounded. ^ a b Brooke 1968, p. 79. ^ Brooke 1968, p. 151. ^ Morkinskinna records that Magnus III of Norway “was much smitten” with “the emperor's daughter…with whom he had exchanged messages…Matilda”. No other reference to this alleged daughter has been found. Andersson, T. M. and Gade, K. E. (trans.) (2000) Morkinskinna (Cornell), 58, p. 307. ^ Brooke 1968, p. 145. Brooke, Z.N. (1968). "Germany under Henry IV and Henry V". In Tanner, J.R.; Previte-Orton, C.W. ; Brooke, Z.N. (eds.). The Cambridge Medieval History. Volume V. Cambridge University Press. Brooke, Z.N. (1968). "Gregory VII and the first Contest between Empire and Papacy". In Tanner, J.R.; Previte-Orton, C.W. ; Brooke, Z.N. (eds.). The Cambridge Medieval History. Volume V. Cambridge University Press. Charter given by Henry to the bishopric of Bamberg, 17.8.1057. Photography taken from the collections of the Lichtbildarchiv älterer Originalurkunden at Marburg University showing the emperor's seal. Whitney, J.P. (1968). "The Reform of the Church". In Tanner, J.R.; Previte-Orton, C.W. ; Brooke, Z.N. (eds.). The Cambridge Medieval History. Volume V. Cambridge University Press. Tul Israngura Na Ayudhya. “‘Not against the kingdom, but for the kingdom and my freedom’ Revisiting the Saxon War (1073-1075): Opposition to the King or a Revolt for the Kingdom?.” Veridian E-Journal Silpakorn University 11, 5 (July-December 2018): 123-150.